Copyright © 2018 W3C® (MIT, ERCIM, Keio, Beihang). W3C liability, trademark and permissive document license rules apply. The working group maintains a list of all bug reports. New features for this specification are expected to be incubated in the Web Platform Incubator Community Group. One editorial issue (removing the exposure of createObjectURL(mediaSource) in workers) was addressed since the previous publication. For the list of changes done since the previous version, see the commits. By publishing this Recommendation, W3C expects the functionality specified in this Recommendation will not be affected by changes to File API. The Working Group will continue to track these specifications. This document was published by the HTML Media Extensions Working Group as an Editor's Draft. Comments regarding this document are welcome. Please send them to public-html-media@w3.org (subscribe, archives). This document is governed by the 1 February 2018 W3C Process Document. This version of the specification is intended for incubating a new codec switching feature, as outlined in the Codec Switching Explainer. The decode timestamp indicates the latest time at which the frame needs to be decoded assuming instantaneous decoding and rendering of this and any dependant frames (this is equal to the presentation timestamp of the earliest frame, in presentation order, that is dependant on this frame). If frames can be decoded out of presentation order, then the decode timestamp MUST be present in or derivable from the byte stream. The user agent MUST run the append error algorithm if this is not the case. If frames cannot be decoded out of presentation order and a decode timestamp is not present in the byte stream, then the decode timestamp is equal to the presentation timestamp. A sequence of bytes that contain all of the initialization information required to decode a sequence of media segments. This includes codec initialization data, Track ID mappings for multiplexed segments, and timestamp offsets (e.g., edit lists). The origin of the MediaSource object URL is the relevant settings object of this during the call to createObjectURL(). For the purposes of determining if HTMLMediaElement.buffered contains a TimeRange that includes the current playback position, implementations MAY choose to allow a current playback position at or after presentation start time and before the first TimeRange to play the first TimeRange if that TimeRange starts within a reasonably short time, like 1 second, after presentation start time. This allowance accommodates the reality that muxed streams commonly do not begin all tracks precisely at presentation start time. Implementations MUST report the actual buffered range, regardless of this allowance. A reference to a specific time in the presentation. The presentation timestamp in a coded frame indicates when the frame SHOULD be rendered. The specific byte stream format specification that describes the format of the byte stream accepted by a SourceBuffer instance. The byte stream format specification, for a SourceBuffer object, is initially selected based on the type passed to the addSourceBuffer() call that created the object, and can be updated by changeType() calls on the object. A byte stream format specific structure that provides the Track ID, codec configuration, and other metadata for a single track. Each track description inside a single initialization segment has a unique Track ID. The user agent MUST run the append error algorithm if the Track ID is not unique within the initialization segment. Each MediaSource object has a live seekable range variable that stores a normalized TimeRanges object. This variable is initialized to an empty TimeRanges object when the MediaSource object is created, is maintained by setLiveSeekableRange() and clearLiveSeekableRange(), and is used in HTMLMediaElement Extensions to modify HTMLMediaElement.seekable behavior. SourceBuffer objects in this list MUST appear in the same order as they appear in the sourceBuffers attribute; e.g., if only sourceBuffers and sourceBuffers are in activeSourceBuffers, then activeSourceBuffers MUST equal sourceBuffers and activeSourceBuffers MUST equal sourceBuffers. The duration change algorithm will adjust new duration higher if there is any currently buffered coded frame with a higher end time. appendBuffer() and endOfStream() can update the duration under certain circumstances. Abort the buffer append algorithm if it is running. This should trigger TextTrackList [ HTML51 ] logic to queue a task to fire a trusted event named removetrack, that does not bubble and is not cancelable, and that uses the TrackEvent interface, with the track attribute initialized to the TextTrack object, at the HTMLMediaElement textTracks list. If the mode attribute on the TextTrack object was "showing" or "hidden" at the beginning of this removal step, then this should also trigger TextTrackList [ HTML51 ] logic to queue a task to fire a simple event named change at the HTMLMediaElement textTracks list. This should trigger TextTrackList [ HTML51 ] logic to queue a task to fire a trusted event named removetrack, that does not bubble and is not cancelable, and that uses the TrackEvent interface, with the track attribute initialized to the TextTrack object, at the SourceBuffer textTracks list. If the mode attribute on the TextTrack object was "showing" or "hidden" at the beginning of this removal step, then this should also trigger TextTrackList [ HTML51 ] logic to queue a task to fire a simple event named change at the SourceBuffer textTracks list. Updates the live seekable range variable used in HTMLMediaElement Extensions to modify HTMLMediaElement.seekable behavior. start double ✘ ✘ The start of the range, in seconds measured from presentation start time. While set, and if duration equals positive Infinity, HTMLMediaElement.seekable will return a non-empty TimeRanges object with a lowest range start timestamp no greater than start. end double ✘ ✘ The end of range, in seconds measured from presentation start time. While set, and if duration equals positive Infinity, HTMLMediaElement.seekable will return a non-empty TimeRanges object with a highest range end timestamp no less than end. If start is negative or greater than end, then throw a TypeError exception and abort these steps. Set live seekable range to be a new normalized TimeRanges object containing a single range whose start position is start and end position is end. If live seekable range contains a range, then set live seekable range to be a new empty TimeRanges object. If true is returned from this method, it only indicates that the MediaSource implementation is capable of creating SourceBuffer objects for the specified MIME type. An addSourceBuffer() call SHOULD still fail if sufficient resources are not available to support the addition of a new SourceBuffer. If the resource fetch algorithm was invoked with a media provider object that is a MediaSource object or a URL record whose object is a MediaSource object, then let mode be local, skip the first step in the resource fetch algorithm (which may otherwise set mode to remote) and add the steps and clarifications below to the "Otherwise (mode is local)" section of the resource fetch algorithm. The resource fetch algorithm's first step is expected to eventually align with selecting local mode for URL records whose objects are media provider objects. The intent is that if the HTMLMediaElement's src attribute or selected child <source>'s src attribute is a blob: URL matching a MediaSource object URL when the respective src attribute was last changed, then that MediaSource object is used as the media provider object and current media resource in the local mode logic in the resource fetch algorithm. This also means that the remote mode logic that includes observance of any preload attribute is skipped when a MediaSource object is attached. Even with that eventual change to [ HTML51 ], the execution of the following steps at the beginning of the local mode logic is still required when the current media resource is a MediaSource object. Relative to the action which triggered the media element's resource selection algorithm, these steps are asynchronous. The resource fetch algorithm is run after the task that invoked the resource selection algorithm is allowed to continue and a stable state is reached. Implementations may delay the steps in the "Otherwise" clause, below, until the MediaSource object is ready for use. Run the "If the media data cannot be fetched at all, due to network errors, causing the user agent to give up trying to fetch the resource" steps of the resource fetch algorithm's media data processing steps list. Set the media element's delaying-the-load-event-flag to false. Text in the resource fetch algorithm or the media data processing steps list that refers to "the download", "bytes received", or "whenever new data for the current media resource becomes available" refers to data passed in via appendBuffer(). References to HTTP in the resource fetch algorithm and the media data processing steps list do not apply because the HTMLMediaElement does not fetch media data via HTTP when a MediaSource is attached. An attached MediaSource does not use the remote mode steps in the resource fetch algorithm, so the media element will not fire "suspend" events. Though future versions of this specification will likely remove "progress" and "stalled" events from a media element with an attached MediaSource, user agents conforming to this version of the specification may still fire these two events as these [ HTML51 ] references changed after implementations of this specification stabilized. The following steps are run in any case where the media element is going to transition to NETWORK_EMPTY and queue a task to fire a simple event named emptied at the media element. These steps SHOULD be run right before the transition. Going forward, this algorithm is intended to be externally called and run in any case where the attached MediaSource, if any, must be detached from the media element. It MAY be called on HTMLMediaElement [ HTML51 ] operations like load() and resource fetch algorithm failures in addition to, or in place of, when the media element transitions to NETWORK_EMPTY. Resource fetch algorithm failures are those which abort either the resource fetch algorithm or the resource selection algorithm, with the exception that the "Final step" [ HTML51 ] is not considered a failure that triggers detachment. The media element looks for media segments containing the new playback position in each SourceBuffer object in activeSourceBuffers. Any position within a TimeRange in the current value of the HTMLMediaElement.buffered attribute has all necessary media segments buffered for that position. Per HTMLMediaElement ready states [ HTML51 ] logic, HTMLMediaElement.readyState changes may trigger events on the HTMLMediaElement. The media element waits until an appendBuffer() call causes the coded frame processing algorithm to set the HTMLMediaElement.readyState attribute to a value greater than HAVE_METADATA. The web application can use buffered and HTMLMediaElement.buffered to determine what the media element needs to resume playback. If the readyState attribute is "ended" and the new playback position is within a TimeRange currently in HTMLMediaElement.buffered, then the seek operation must continue to completion here even if one or more currently selected or enabled track buffers' largest range end timestamp is less than new playback position. This condition should only occur due to logic in buffered when readyState is "ended". If new duration is less than the highest presentation timestamp of any buffered coded frames for all SourceBuffer objects in sourceBuffers, then throw an InvalidStateError exception and abort these steps. Let highest end time be the largest track buffer ranges end time across all the track buffers across all SourceBuffer objects in sourceBuffers. This condition can occur because the coded frame removal algorithm preserves coded frames that start before the start of the removal range. Update new duration to equal highest end time. Update the media duration to new duration and run the HTMLMediaElement duration change algorithm. Run the duration change algorithm with new duration set to the largest track buffer ranges end time across all the track buffers across all SourceBuffer objects in sourceBuffers. Run the "If the connection is interrupted after some media data has been received, causing the user agent to give up trying to fetch the resource" steps of the resource fetch algorithm's media data processing steps list. Run the "If the media data can be fetched but is found by inspection to be in an unsupported format, or can otherwise not be rendered at all" steps of the resource fetch algorithm's media data processing steps list. Run the media data is corrupted steps of the resource fetch algorithm's media data processing steps list. Controls how a sequence of media segments are handled. This attribute is initially set by addSourceBuffer() after the object is created, and can be updated by changeType() or setting this attribute. Indicates whether the asynchronous continuation of an appendBuffer() or remove() operation is still being processed. This attribute is initially set to false when the object is created. Text track-buffers are included in the calculation of highest end time, above, but excluded from the buffered range calculation here. They are not necessarily continuous, nor should any discontinuity within them trigger playback stall when the other media tracks are continuous over the same time range. Appends the segment data in an BufferSource[ WEBIDL ] to the source buffer. Changes the MIME type associated with this object. Subsequent appendBuffer() calls will expect the newly appended bytes to conform to the new type. If type contains a MIME type that is not supported or contains a MIME type that is not supported with the types specified (currently or previously) of SourceBuffer objects in the sourceBuffers attribute of the parent media source, then throw a NotSupportedError exception and abort these steps. Update the generate timestamps flag on this SourceBuffer object to the value in the "Generate Timestamps Flag" column of the byte stream format registry [ MSE-REGISTRY ] entry that is associated with type. Set the mode attribute on this SourceBuffer object to "sequence", including running the associated steps for that attribute being set. Keep the previous value of the mode attribute on this SourceBuffer object, without running any associated steps for that attribute being set. Set pending initialization segment for changeType flag to true. start double ✘ ✘ The start of the removal range, in seconds measured from presentation start time. end unrestricted double ✘ ✘ The end of the removal range, in seconds measured from presentation start time. Each track buffer has a track buffer ranges variable that represents the presentation time ranges occupied by the coded frames currently stored in the track buffer. For track buffer ranges, these presentation time ranges are based on presentation timestamps, frame durations, and potentially coded frame group start times for coded frame groups across track buffers in a muxed SourceBuffer. For specification purposes, this information is treated as if it were stored in a normalized TimeRanges object. Intersected track buffer ranges are used to report HTMLMediaElement.buffered, and MUST therefore support uninterrupted playback within each range of HTMLMediaElement.buffered. These coded frame group start times differ slightly from those mentioned in the coded frame processing algorithm in that they are the earliest presentation timestamp across all track buffers following a discontinuity. Discontinuities can occur within the coded frame processing algorithm or result from the coded frame removal algorithm, regardless of mode. The threshold for determining disjointness of track buffer ranges is implementation-specific. For example, to reduce unexpected playback stalls, implementations MAY approximate the coded frame processing algorithm's discontinuity detection logic by coalescing adjacent ranges separated by a gap smaller than 2 times the maximum frame duration buffered so far in this track buffer. Implementations MAY also use coded frame group start times as range start times across track buffers in a muxed SourceBuffer to further reduce unexpected playback stalls. The input buffer is a byte buffer that is used to hold unparsed bytes across appendBuffer() calls. The buffer is empty when the SourceBuffer object is created. The buffer full flag keeps track of whether appendBuffer() is allowed to accept more bytes. It is set to false when the SourceBuffer object is created and gets updated as data is appended and removed. If the input buffer contains bytes that violate the SourceBuffer byte stream format specification, then run the append error algorithm and abort this algorithm. If the first initialization segment received flag is false or the pending initialization segment for changeType flag is true, then run the append error algorithm and abort this algorithm. This algorithm is called when an error occurs during an append. Run the end of stream algorithm with the error parameter set to "decode". This is the signal that the implementation was unable to evict enough data to accommodate the append or the append is too big. The web application SHOULD use remove() to explicitly free up space and/or reduce the size of the append. Let start equal the starting presentation timestamp for the removal range, in seconds measured from presentation start time. Let end equal the end presentation timestamp for the removal range, in seconds measured from presentation start time. Each SourceBuffer object has an internal first initialization segment received flag that tracks whether the first initialization segment has been appended and received by this algorithm. This flag is set to false when the SourceBuffer is created and is updated by the algorithm below. Each SourceBuffer object has an internal pending initialization segment for changeType flag that tracks whether an initialization segment is needed since the most recent changeType(). This flag is set to false when the SourceBuffer is created, set to true by changeType() and reset to false by the algorithm below. If the initialization segment has no audio, video, or text tracks, then run the append error algorithm and abort these steps. Verify the following properties. If any of the checks fail then run the append error algorithm and abort these steps. If more than one track for a single type are present (e.g., 2 audio tracks), then the Track IDs match the ones in the first initialization segment. The codecs for each track are supported by the user agent. User agents MAY consider codecs, that would otherwise be supported, as "not supported" here if the codecs were not specified in type parameter passed to (a) the most recently successful changeType() on this SourceBuffer object, or (b) if no successful changeType() has yet occurred on this object, the addSourceBuffer() that created this SourceBuffer object. For example, if the most recently successful changeType() was called with 'video/webm' or 'video/webm; codecs="vp8"', and a video track containing vp9 appears in the initialization segment, then the user agent MAY use this step to trigger a decode error even if the other two properties' checks, above, pass. Implementations are encouraged to trigger error in such cases only when the codec is indeed not supported or the other two properties' checks fail. Web authors are encouraged to use changeType(), addSourceBuffer() and isTypeSupported() with precise codec parameters to more proactively detect user agent support. changeType() is required if the SourceBuffer object's bytestream format is changing. If the initialization segment contains tracks with codecs the user agent does not support, then run the append error algorithm and abort these steps. User agents MAY consider codecs, that would otherwise be supported, as "not supported" here if the codecs were not specified in type parameter passed to (a) the most recently successful changeType() on this SourceBuffer object, or (b) if no successful changeType() has yet occurred on this object, the addSourceBuffer() that created this SourceBuffer object. For example, MediaSource.isTypeSupported('video/webm;codecs="vp8,vorbis"') may return true, but if addSourceBuffer() was called with 'video/webm;codecs="vp8"' and a Vorbis track appears in the initialization segment, then the user agent MAY use this step to trigger a decode error. Implementations are encouraged to trigger error in such cases only when the codec is indeed not supported. Web authors are encouraged to use changeType(), addSourceBuffer() and isTypeSupported() with precise codec parameters to more proactively detect user agent support. changeType() is required if the SourceBuffer object's bytestream format is changing. If audio language equals the 'und' BCP 47 value, then assign an empty string to audio language. Let audio kinds be a sequence of kind strings specified in the initialization segment for this track or a sequence with a single empty string element in it if no kind information is provided. This should trigger AudioTrackList [ HTML51 ] logic to queue a task to fire a trusted event named addtrack, that does not bubble and is not cancelable, and that uses the TrackEvent interface, with the track attribute initialized to new audio track, at the AudioTrackList object referenced by the audioTracks attribute on this SourceBuffer object. This should trigger AudioTrackList [ HTML51 ] logic to queue a task to fire a trusted event named addtrack, that does not bubble and is not cancelable, and that uses the TrackEvent interface, with the track attribute initialized to new audio track, at the AudioTrackList object referenced by the audioTracks attribute on the HTMLMediaElement. If video language equals the 'und' BCP 47 value, then assign an empty string to video language. Let video kinds be a sequence of kind strings specified in the initialization segment for this track or a sequence with a single empty string element in it if no kind information is provided. This should trigger VideoTrackList [ HTML51 ] logic to queue a task to fire a trusted event named addtrack, that does not bubble and is not cancelable, and that uses the TrackEvent interface, with the track attribute initialized to new video track, at the VideoTrackList object referenced by the videoTracks attribute on this SourceBuffer object. This should trigger VideoTrackList [ HTML51 ] logic to queue a task to fire a trusted event named addtrack, that does not bubble and is not cancelable, and that uses the TrackEvent interface, with the track attribute initialized to new video track, at the VideoTrackList object referenced by the videoTracks attribute on the HTMLMediaElement. If text language equals the 'und' BCP 47 value, then assign an empty string to text language. Let text kinds be a sequence of kind strings specified in the initialization segment for this track or a sequence with a single empty string element in it if no kind information is provided. This should trigger TextTrackList [ HTML51 ] logic to queue a task to fire a trusted event named addtrack, that does not bubble and is not cancelable, and that uses the TrackEvent interface, with the track attribute initialized to new text track, at the TextTrackList object referenced by the textTracks attribute on this SourceBuffer object. This should trigger TextTrackList [ HTML51 ] logic to queue a task to fire a trusted event named addtrack, that does not bubble and is not cancelable, and that uses the TrackEvent interface, with the track attribute initialized to new text track, at the TextTrackList object referenced by the textTracks attribute on the HTMLMediaElement. Set pending initialization segment for changeType flag to false. Per HTMLMediaElement ready states [ HTML51 ] logic, HTMLMediaElement.readyState changes may trigger events on the HTMLMediaElement. This particular transition should trigger HTMLMediaElement logic to queue a task to fire a simple event named loadedmetadata at the media element. Some implementations MAY choose to collect some of these coded frames with presentation timestamp less than appendWindowStart and use them to generate a splice at the first coded frame that has a presentation timestamp greater than or equal to appendWindowStart even if that frame is not a random access point. Supporting this requires multiple decoders or faster than real-time decoding so for now this behavior will not be a normative requirement. 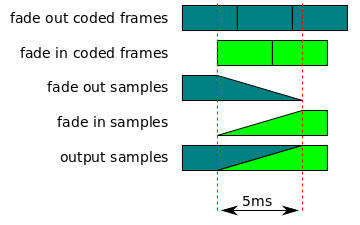 Some implementations MAY choose to collect coded frames with presentation timestamp less than appendWindowEnd and frame end timestamp greater than appendWindowEnd and use them to generate a splice across the portion of the collected coded frames within the append window at time of collection, and the beginning portion of later processed frames which only partially overlap the end of the collected coded frames. Supporting this requires multiple decoders or faster than real-time decoding so for now this behavior will not be a normative requirement. In conjunction with collecting coded frames that span appendWindowStart, implementations MAY thus support gapless audio splicing. The greater than check is needed because bidirectional prediction between coded frames can cause presentation timestamp to not be monotonically increasing even though the decode timestamps are monotonically increasing. If the HTMLMediaElement.readyState attribute is HAVE_METADATA and the new coded frames cause HTMLMediaElement.buffered to have a TimeRange for the current playback position, then set the HTMLMediaElement.readyState attribute to HAVE_CURRENT_DATA. If the HTMLMediaElement.readyState attribute is HAVE_CURRENT_DATA and the new coded frames cause HTMLMediaElement.buffered to have a TimeRange that includes the current playback position and some time beyond the current playback position, then set the HTMLMediaElement.readyState attribute to HAVE_FUTURE_DATA. If the HTMLMediaElement.readyState attribute is HAVE_FUTURE_DATA and the new coded frames cause HTMLMediaElement.buffered to have a TimeRange that includes the current playback position and enough data to ensure uninterrupted playback, then set the HTMLMediaElement.readyState attribute to HAVE_ENOUGH_DATA. Update presentation timestamp and decode timestamp to the nearest audio sample timestamp based on sample rate of the audio in overlapped frame. If a timestamp is equidistant from both audio sample timestamps, then use the higher timestamp (e.g., floor(x * sample_rate + 0.5) / sample_rate). Allows the SourceBuffer objects in the list to be accessed with an array operator (i.e., ). This algorithm is intended to mirror the behavior of the createObjectURL()[ FILE-API ] method, which does not auto-revoke the created URL. Web authors are encouraged to use revokeObjectURL()[ FILE-API ] for any MediaSource object URL that is no longer needed for attachment to a media element. Return a unique MediaSource object URL that can be used to dereference the mediaSource argument. Let union ranges be the union of live seekable range and the HTMLMediaElement.buffered attribute. Return a single range with a start time equal to the earliest start time in union ranges and an end time equal to the highest end time in union ranges and abort these steps. The bytes provided through appendBuffer() for a SourceBuffer form a logical byte stream. The format and semantics of these byte streams are defined in byte stream format specifications. The byte stream format registry [ MSE-REGISTRY ] provides mappings between a MIME type that may be passed to addSourceBuffer(), isTypeSupported() or changeType() and the byte stream format expected by a SourceBuffer using that MIME type for parsing newly appended data. Implementations are encouraged to register mappings for byte stream formats they support to facilitate interoperability. The byte stream format registry [ MSE-REGISTRY ] is the authoritative source for these mappings. If an implementation claims to support a MIME type listed in the registry, its SourceBuffer implementation MUST conform to the byte stream format specification listed in the registry entry. Track IDs are not the same across initialization segments, for segments describing multiple tracks of a single type (e.g., 2 audio tracks). Unsupported codec changes occur across initialization segments. See the initialization segment received algorithm, addSourceBuffer() and changeType() for details and examples of codec changes. Support seamless playback of media segments having a timestamp gap smaller than the audio frame size. User agents MUST NOT reflect these gaps in the buffered attribute. This is intended to simplify switching between audio streams where the frame boundaries don't always line up across encodings (e.g., Vorbis). The decoding capabilities needed to decode each track (i.e., codec and codec parameters) are not provided. The key words MAY, MUST, MUST NOT, SHOULD, and SHOULD NOT are to be interpreted as described in [ RFC2119 ]. The video playback quality metrics described in previous revisions of this specification (e.g., sections 5 and 10 of the Candidate Recommendation) are now being developed as part of [ MEDIA-PLAYBACK-QUALITY ]. Some implementations may have implemented the earlier draft VideoPlaybackQuality object and the HTMLVideoElement extension method getVideoPlaybackQuality() described in those previous revisions.